Wow... So much to catch up on... So, Mateo has been doing GREAT! We have not been in the hospital since baby Aneli was about 3 weeks old! So that's almost 9 months! This is a record breaking streak for us! 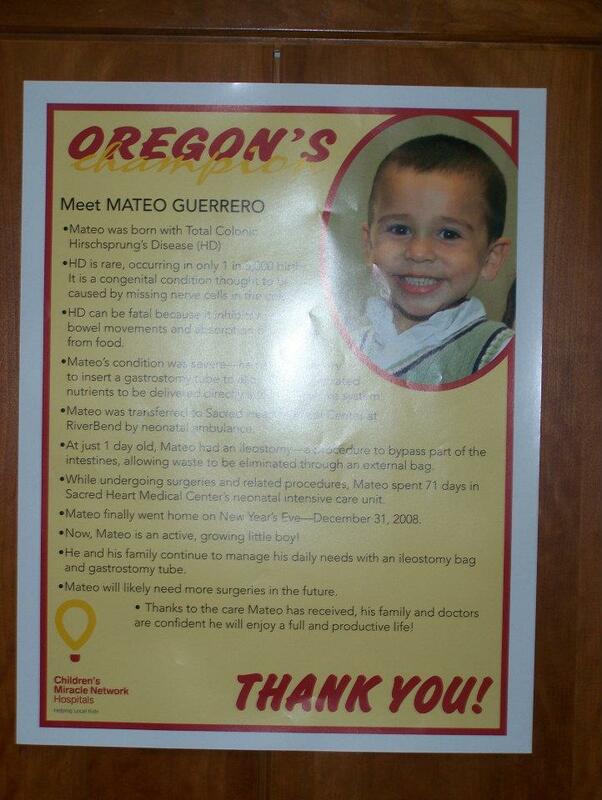 Mateo is doing wonderfully. He is above average for his height and weight, and does everything any other kids his age do. Dr Terry, his gastroenterologist just recently opened his diet, so he can pretty much eat anything he wants minus sugars and regular milk. Not too long ago, we got Mateo off the bottle ( at 3 almost 4 years old!) and we are so proud of him! He is drinking his neocate ( elemental formula) from a sippy cup now and has been weened down to only 3 cups of formula a day. He is eating more food now and tolerating it well. 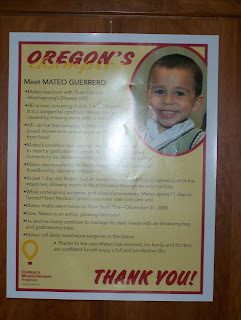 On the CMN front, because of his story, his strength and his will to thrive, he was chosen as Children's Miracle Network's Champion ( ambassador) for the entire state of Oregon!! 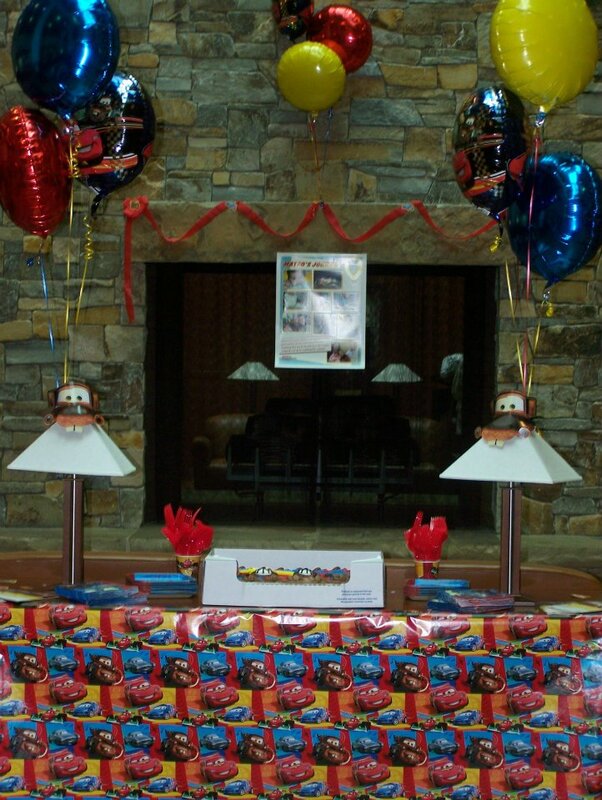 Mateo was celebrated as the Oregon Champion by having a "Cars" themed party right in the main lobby of Sacred Heart Medical Center @ Riverbend! Family, friends, and hospital staff were all there to help us celebrate, and Mateo got a HUGE suprise! Before his party, Eugene and Springfield Fire came to our house with TWO FIRE ENGINES! Mateo got to honk the horn, spray the hose, and was given a hat and sweatshirt that say Springfield fire on them! Better yet, the bigger fire engine drove Mateo and his papi from our house to his party!! How cool is that?! After his party, Mateo expected the engine to be there to pick him up like his personal car! LOL!! So what being the Champion means is that we keep on doing what we are doing: going to CMN events, sharing our story, etc. And here in 13 days,we get to go to Washington D.C. and to Orlando, Fl ( Disney World!). We will be on our trip for 7 days promoting CMN with 50ish other CMN families! We are so excited and cannot wait for our trip! One event we got to go to for CMN this summer was a Klamath Falls Gem's baseball game! Mateo got to meet Ms. Oregon and got to throw the first pitch of the game! It was a great weekend! We are so gratefull for CMN Hospitals and all they do to help us as well as families like us! THANK YOU CMN! !